How Fiesta San Juan of El Puerto exceeds Spanish traditions by unusual beach fun. 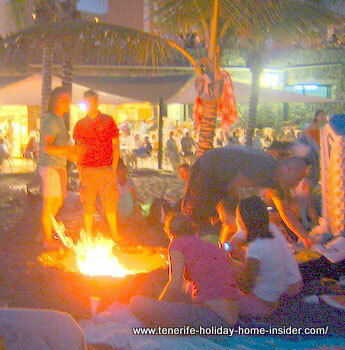 Every year at Fiesta San Juan Puerto de la Cruz on June 23, many a beach bonfire and one huge one are lit. The one depicted was made by private people at night at Playa Jardin. You may scroll to the bottom of this page to discover more about it as well as about the June solstice. Of course, the date of the day of the Solstice can change. What makes San Juan the fiesta unique in Puerto de la Cruz? Note in this context that Puerto de la Cruz is also called El Puerto which means the harbor. In fact, it was El Puerto (harbor) of La Orotava. This port makes all the difference to its Fiesta of San Juan. Also, it makes it so exciting. 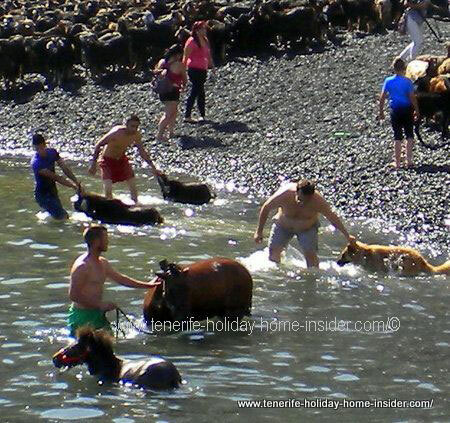 It's this second event of the San Juan holiday with animals bathing which is so unusual. What explains it is the fact that it goes back to Tenerife's long lost Guanche aborigines. Their ancient custom is like the salt in the soup for the event. It exceeds the normal Spanish traditions of all its Fiestas of San Juan. It gives it a very alluring touch. 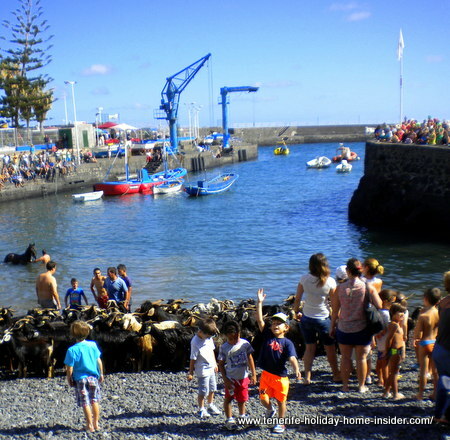 The Guanche took big herds of goats to the Puerto Cruz shores in the morning after the June solstice and this is still done now. What's the secret of beating the ancient Guanche custom? The answer is that the Guanche didn't know horses. I saw two goats which were dipped by two young men. A long hair dog didn't seem to be keen to enter the water and was pulled to have his salt water bath. A young horse was held and led by its harness. The same was most probably the case with the black foal but, the photo doesn't show that. 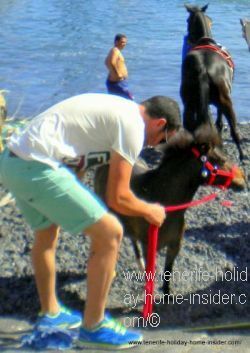 By the way I had seen a young man handling the cute foal by its red harness on the beach. That baby horse had a shiny black body and such a funny mane. It stood straight up from the top of its head. I am sure it was cut like that on purpose. Horses in the ocean besides goats at Fiesta San Juan. Admire the horses in the ocean together with the brave little foal. It was looking at an older man who kept an eye on it. He stood several meters away from it. The young man to the right was full of praise for the extremely young horse during the San Juan fiesta. The young man with the green swimming trunks is obviously no stranger to swimming with horses, as the photo shows. Indeed, he swam with the gutsy black foal. Why can't you swim with Tenerife whales and dolphins but with horses? 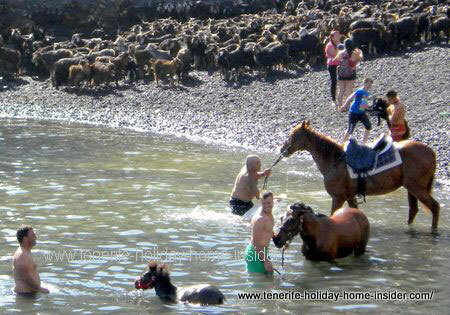 Can you believe that swimming with horses, is not forbidden on the biggest Canary Island? Well it is possible during Fiesta San Juan in Tenerife. On the other hand, swimming with whales and dolphins in the wild is against the law. Of course, farm animals may not be considered as wild. By the way, the waves were not high for the animals' bath. Everything was very peaceful under a warm sun and brilliant blue skies on that June day in Puerto de la Cruz. But, I don't think that the water was much warmer than 18 degrees Celsius on that day. Fiesta San Juan bathing of goats where small children had much beach fun. Depicted is a photo of Fiesta San Juan which was taken from a different angle. A young boy was carrying a goat into the sea to bath it. Many goats of all ages and colors were still assembled to the left and to the right by the pebble beach of the ancient port. Very few guys still dragged goats on leashes towards the water. Most seemed to have been in in it. The Guanches are said to have bathed them to purify them and to render them more healthy as well as fertile. Many small children gazed at all this action with much excitement. This was great beach fun. for them. Most certainly, the iodine or salt of the sea is also good for the skin of land animals. By the way, some riders entered the water on horse back which is the normal way for horses to get a bath. Anyway, the Tenerife Fiesta San Juan Puerto de la Cruz is a fantastic occasion of family fun activities for locals and tourists alike, as many of the pictures which I took show me.